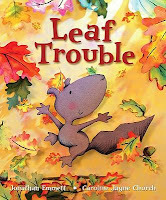 Pip Squirrel is going about his day when he notices the leaves on the tree are changing color. He is so shocked, he lets go of the tree and falls. Then he attempts to collect the leaves and reattach them to the tree. His mother, when she discovers what he is up to, smiles and explains about the tree. It is a great little story. The squirrels look more like dogs with funny tails but other than that the illustrations are great. The trees and the leaves in full bloom are extremely well done. This is a fun, bright colorful book to share with children.